By this time of year, many people mistakenly think they’re completely home free when it comes to taking care of their outdoor space and that Mother Nature will miraculously take over the reins. Of course, this couldn’t be further from the truth and the fact is that executing proper lawn care and maintenance in the fall is essential to ensuring the year-round health and longevity of your grass. There are a few key steps you should be taking before the harsh and cold winter months hit in order to give your grass the head start it needs to survive the upcoming months. This includes aerating, overseeding, planting trees, and fertilizing your grass among other things. Overseeding is the process of planting new grass seeds into the existing turf without having to remove or uproot the older grass. The purpose of overseeding is to boost the density of your lawn, fill in the areas where the grass has died off or turned brown, and to generally enhance the appearance and health of your lawn. 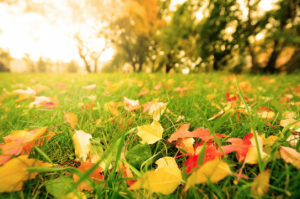 The reason that fall is the best time to do this is because the soil has still retained some of its heat and moisture from the previous season, which means your new grass seeds will endure a lot longer and if you do it right before the first frost in the season, you’ll have better control over the length of the grass as it begins to grow. Fall is also the ideal time of year to plant new trees, shrubs, and greenery because it gives them a chance to develop strong root systems and establish healthy foundations in preparation for spring and summer. There are plenty of plants that thrive in the wintertime simply because they have the chance to spread out their roots and strengthen their internal foundations during the colder months of the year. This process helps to ensure that they’ll produce beautiful, healthy, and long lasting above ground plants later on in the year. For this reason, it’s highly important that you properly aerate and fertilize your soil during the fall and remove all fallen leaves and other debris promptly and frequently as these can obstruct plants from reaching their full potential. Aerating and fertilizing also gives your plants a chance to comfortably and freely spread out their roots more evenly underground while also absorbing all of the essential vitamins and nutrients from the soil, which will help them produce higher quality plants. Fertilizing your grass in the fall demonstrates excellent lawn and garden care practices because it allows all of your greenery to absorb more vital nutrients before the climate cools down and the ground dries up and freezes. Once this happens, those nutrients become integrated and locked into your soil so that your plants can access it more easily and completely absorb it. This helps keep your plant roots strong and vital throughout the cold winter months which results in stunning foliage in the spring. In a way, by fertilizing your lawn in the fall, you’re also giving your plants a head start for the coming warmer seasons. Even if your lawn looks brown and inactive as winter approaches, the roots underground are still hard at work absorbing as many vitamins, minerals, and nutrients as possible from the soil in order to sustain themselves for longer periods of time. Whether you’re cultivating a fruitful vegetable garden or lush flowerbeds, it’s always important to take the right steps in preparing them for the winter months. The rapid changes in temperatures along with excessive precipitation in the form of heavy rainfalls, snowfalls, and hailstorms can take a heavy toll on your precious plants. In order to avoid any permanent or devastating damage from occurring, you should always thoroughly clean up your garden. Remove all dead plants, leaves, and debris as these can completely block off any nutrients from reaching the roots of your living plants. It’s also important to pull out invasive weeds and replace old mulch with a layer of fresh compost. Keep in mind that your soil needs to freeze in the wintertime in order to kill off pests and plant diseases, so if your mulch is laid too thick, it could retain too much moisture within the soil and prevent it from freezing up. As mentioned, fall garden maintenance comes with numerous benefits including better and more manageable weed control efforts, preparing your irrigation system for winter, as well as laying a strong foundation for a lush and beautiful garden in the spring. As the temperatures cool down, weeds become a lot easier to manage because the cold ground kills off the majority of the bacteria on which they thrive. Winterizing your irrigation system entails turning off your water supply valve to prevent more water from leaking into your pipes and then methodically removing any trapped or standing water that remains. The reason this is so important is because the excess water will freeze in the winter which could potentially cause your pipes to burst. Another important benefit of practicing proper fall maintenance for your outdoor space is that it sets the tone for how successful spring will be for your garden. The sooner you prepare, the higher the chances are that your plants will flourish once the warm weather arrives. One of the first steps you should take when it comes to practicing good lawn care and maintenance in the fall is contacting a local lawn and garden care expert such as FOREVER GREEN LAWN & LANDSCAPE INC. We have over 20 years of experience caring for people’s outdoor spaces throughout Toronto and the GTA, making us one of the top landscaping experts in Ontario. Contact us today to discuss your next outdoor project!